The German engineered Dahle 50464 MHP Oil-Free Cross Cut Shredder stands as the finest option available in the market due to its unparalleled specifications. This shredder can take 26 sheets at a time and turn them into fragments of 3/16” x 1 1/2" at an amazing speed of 20 ft/min. The cut size is in accordance to level P-4 of DIN Security Standards and minimizes the chance of any compromise on the confidentiality of the documents. 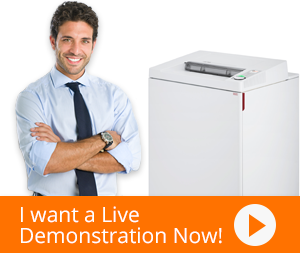 With its feed opening of 12”, this paper shredder can easily handle larger documents. The design of 50464 also features a high capacity shred bin of 30 gallons, making it ideal for catering to a department’s need. The 50464 Cross Cut Shredder comes with the certainty that the machine will maintain top notch performance at all time. With its Matrix High Performance (MHP) cutting cylinders, the shredder can cut through cards and DVDs as well. The Trident grip technology of Dahle 50464 holds the paper continuously from 3 points and keeps the paper from being wedged from one side, thus eliminating the chances of paper jams. The maintenance free shredder comes free from the hassle of regular oiling, making it convenient and economical to use. The cross cut shredder comes with countless security features a simple control dial that can be used to perform all basic functions of the shredder, making the machine safe and effective. The revolutionary Smart Power management system limits the shredder’s power consumption by turning on the standby mode after an inactive period of 10 minutes and completely turning off the shredder after 30 minutes of idleness.